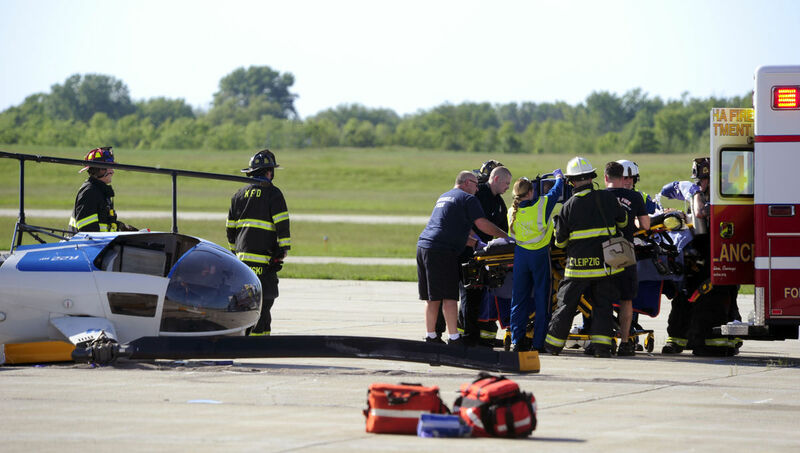 On June 4, 2017, about 1630 central daylight time, a Robinson R22 helicopter, N601HA, impacted the ramp area during landing at Kenosha Regional Airport (ENW), Kenosha, Wisconsin. The commercial rated pilot sustained serious injuries and the helicopter sustained substantial damage. 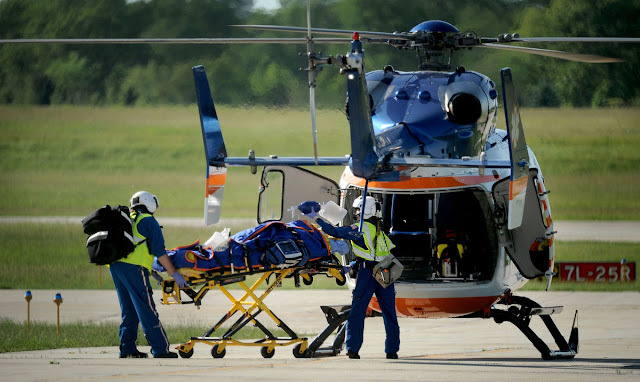 The helicopter was registered to A-Z Leasing LLC, and operated by Lakeshore Helicopter LLC, under the provisions of Title 14 Code of Federal Regulations (CFR) Part 91 as a personal flight. Day visual meteorological conditions prevailed at the time of the accident and no flight plan had been filed. The local flight departed at an unknown time and was attempting to land at the time of the accident. 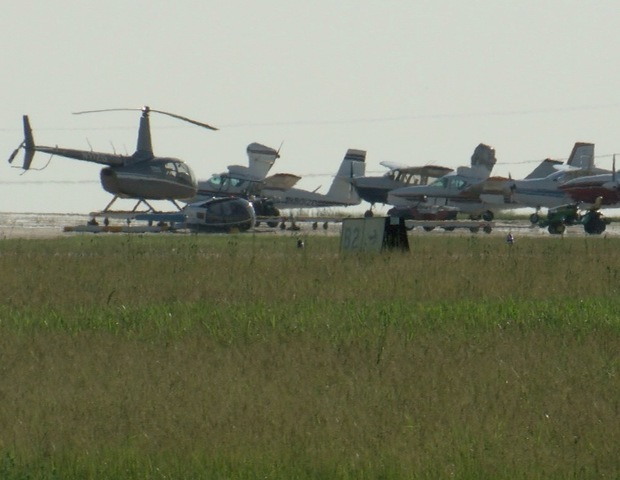 A witness who had just landed at ENW and taxied in toward the ramp reported that the helicopter was near the ground with the rotor blades turning. The helicopter climbed quickly to about 25 to 30 ft above ground level (agl). While airborne the helicopter began to wobble and appeared unsteady. The wobble became more pronounced, then the helicopter descended and impacted the pavement on its right side. Two other witnesses, who were in another airplane that had just landed at ENW, reported that they observed a piece of the helicopter separate and fly though the air. The helicopter made erratic movements, rotated, and impacted the ground. The pilot, age 77, was airlifted to a local hospital. He was unable to provide a statement and according to family members he does not have any recollection of the accident flight. The pilot's third class medical certificate was not valid at the time of accident and had expired on December 1, 2016. A review of the pilot's logbook entries since April 2014 revealed that he had accumulated 10 hours in the R22 helicopter. The rest of the logbooks were not recovered during the investigation. The helicopter impacted the ramp area pavement on it's right side and came to rest in the same location. The empennage separated from the aft end of the tail boom and the tail rotor gear box was separated from it; they were both found to the south of the helicopter. A single tail rotor blade and its separated tip were found to the north of the helicopter. A yellow, wooden helicopter landing dolly was found on the ramp about 50 ft to the west. Ground impact marks and rotor blade strikes were observed in the pavement. A postaccident examination of the wreckage revealed that the fuselage exhibited damage on the front and right side, the empennage was detached from the end of the tailboom. The empennage remained mostly intact and exhibited damage on the horizontal and upper vertical stabilizers. There was extensive damage to the lower and forward portion of the vertical stabilizer. The tail skid stinger was bent upward. There was scoring visible on the lower surface perpendicular to the helicopter centerline. A tail rotor blade was separated near the tail rotor hub and the blade tip was also separated. The blade tip exhibited significant longitudinal scoring on the outboard edge. The other tail rotor blade sustained leading edge damage and remained attached to the rotor hub. The collective was full up and the twist grip was positioned ON, the mixture control knob was found full forward, and the carburetor heat knob was extended about 1/2 inch. The throttle arm attached to the carburetor was in the full ON position. Each of the three controls were intact and functional through their full ranges of travel. The flight controls were separated in multiple locations, but there was no evidence of preimpact malfunctions or failures. The fuel system was intact with no breaches or fuel leaks noted. The fuel gascolator bowl contained a blue liquid with an odor of aviation gasoline and the fuel screen was free on contaminants. Yellow paint transfer was noted on the helicopter chin, windshield bow, lower vertical stabilizer, and tail skid stinger. The helicopter dolly that the pilot reportedly attempted to land on was painted yellow. The engine examination did not reveal any anomalies that would have precluded normal operation. A small amount of 100LL fuel was added to the fuel tank to facilitate an engine functional test. The drive belts were removed, and the engine was run up to 104% rpm. The engine operated normally during the functional test run. 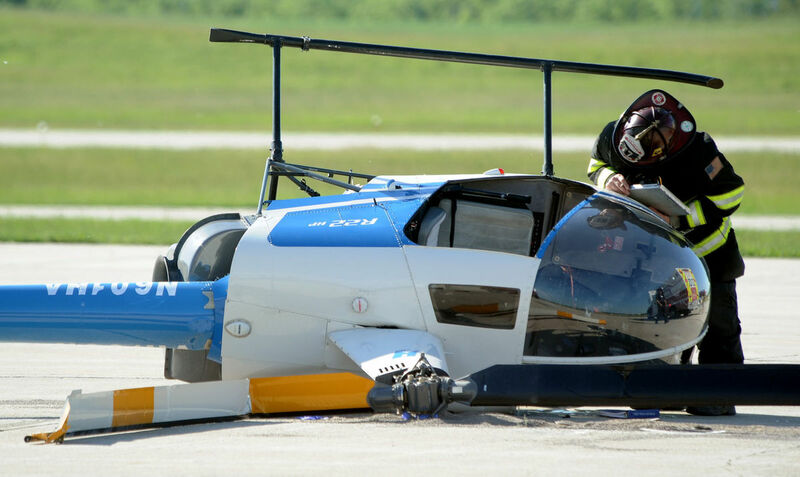 On June 4, 2017, about 1630 central daylight time, a Robinson R22 helicopter, N601HA, impacted pavement after an attempted takeoff at Kenosha Regional Airport (ENW), Kenosha, Wisconsin. The commercial pilot sustained serious injuries and the helicopter sustained substantial damage. The helicopter was registered to A-Z Leasing, LLC., and operated by the pilot under the provisions of 14 Code of Federal Regulations Part 91 as a personal flight. Visual meteorological conditions prevailed at the time of the accident and a flight plan had not been filed. Witnesses reported that the helicopter was departing from the ramp and climbed about 20 to 30 ft above ground level (agl). The helicopter descended and impacted the pavement on its right side. A nearby helicopter pilot ran to the wreckage and turned off the fuel valve and battery switch. The pilot was airlifted to a local hospital. An postaccident examination of the wreckage revealed that the tail rotor assembly separated from the tailcone. One tail rotor blade was separated and the other blade sustained damage.